The Chapel of the Transit is nowadays located of the right part of the apse of the Basilica of Santa Maria degli Angeli, not far away from the church of the Porziuncola. The small structure, in fact, was nothing else than the first-aid room of the group of huts where San Francesco had welcome the first group of friars. The Saint died in this place on October 3rd 1226 after Christ, after he had composed the last verses of the Quantico of the creatures, the ones dedicated to "sora morte", and where he was clearly asking to be deposited on the bare land. 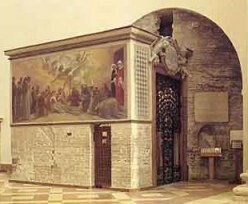 On the left wall of the chapel there is still the wood door of 1200 and on the altar, deposited in a reliquary, the track used by the Saint; the walls has been covered by frescoes around 1520 after Christ by Giovanni Spagna wit the pictures of some Franciscan saints and of the first minor friars, while the statue of San Francesco holding in his hand the Evangel and the Cross in white glazed terracotta was realized around 1490 after Christ by Andrea della Robbia.